Report from 5th place getters - Paul Stein and Mat Cooper [12 KB PDF]. A week after the Champs and we're nearly cleaned up. Cliff Harris and Nowra SES are retrieving the remaining flags off the course. I have to finalise bills and balance the books, waiting for costs resulting from the fire. The big trailer is at Scott's, waiting for someone to take it to the Paddy Pallin. Have you recovered? I was certainly worn out by Sunday night, mentally more than physical. Negatively, the fire at the All Night Cafe was a pity. It seems a gas cylinder tipped over and caught fire through its damaged joint. That fire, in turn, hit another gas cylinder, burning the seal and setting it on fire. We ended up with the corner of the tent melted, three cylinders, the borrowed BBQ and Chris' plastic table beyond repair, Scott's super-burner repairable and, worst of all, Debbie's personal belongings ruined. On the bright side, nobody was hurt. Thanks for leading the fire brigade to the Cafe and delivering the soup and stew to raise spirits. Who'd have thought there would be two Cedar Roads in Bendalong? Some teams had to wait at the cafe for a couple of hours until they could recover their gear from the burning tent but nobody begrudged the delay, aware of the risk. No doubt it was stressful for our team there - Mike, Debbie, Chris & Miles. I heard that Julie and David (overall winners) were near there as the fire erupted. They avoided any delay by taking the 8-hour loop to the north-west, returning to the ANC after things had settled. That's adaptability! Other negatives? Not a lot really. The weather could have been better - most people got softened by a shower or two, then again they got sunshine as well. Stewart Johnstone spent a couple of nights in Wollongong hospital on his way home ... hope we didn't cause that. I don't think I'll try to organise public transport again, prefering to promote car pooling in the future. Presumably the budget's blown after covering costs of the fire. Obviously there were comments about leeches and scratchy bush but we were very clear in our instructions - no false advertising! We shouldn't have tried to put #69 on Green Island. After the seas in the last week the sandspit was gone and it wasn't good getting there, whatever the tide. On the positives, Admin and hash-house were exemplary. Having the six-hour finish on Sunday meant there was a low-stress mood on Saturday evening and we had a great team keeping food bubbling and tummies satisfied. Scott's menu and quantities were an improvement on our effort at Turon last year. The course worked well - people enjoyed the lake crossing and beaches - and we enticed most of them to enjoy the beaches. I'm happy that the controls were all positioned well, despite protests about numbers 74 and 76. Had lots of compliments since the event. National Parks were supportive, thanks to Libby Shields. One really pleasing aspect was our team. I deliberately didn't ask any specific person to "volunteer", rather hoping that people would respond to my footnotes about needing help, which they did. Graeme Cooper for event administration and trailer-packing supervision. Glenn Lavender, George Takacs & Pawel Wagner helped with the course, Michael Bright with water-drops and safety runs during the night. And I hadn’t forgotten you & Belinda doing everything. Thank you very much for the excellent map, all the points you set (even #100), flags you hung, all the event administration, and everyting else. It looks like we've run out of places for seaside 24-hours on the South Coast. 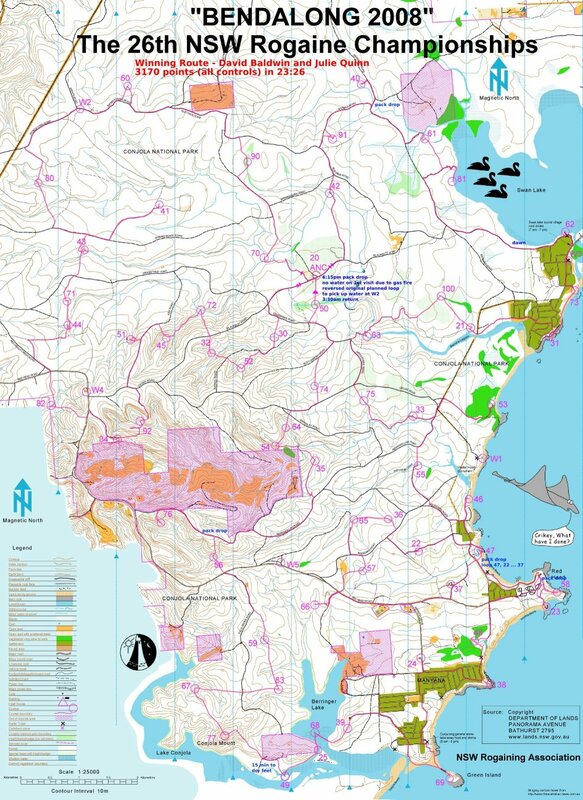 Unless we start re-using areas the next available space must be somewhere past Bermagui, towards the Tathra area that Julie & David used a couple of years back. Photos by Trevor Gollan. Click on a picture for an enlargement then click the "back" button on your browser to return here.